A unique outreach campaign has been launched that will allow the general public to follow scientists from around the globe as they search for an Earth-like exoplanet around the closest star to us, Proxima Centauri. The observing campaign will run from January to April 2016 and will be accompanied by blog posts and social media updates. No one knows what the outcome will be. In the months following the observations, the scientists will analyse the data and submit the results to a peer-reviewed journal. At a distance of just 4.2 light-years from the Sun, and located in the constellation of Centaurus, Proxima Centauri is the closest known star to the Sun. Previous observations have provided tantalising, but weak hints of a small companion orbiting this red dwarf star, but this new campaign will make a more sensitive search for the telltale wobbles in the dwarf star’s orbital motion that might reveal the presence of an Earth-like orbiting planet. Observations will be made with the High Accuracy Radial velocity Planet Searcher (HARPS), attached to ESO’s 3.6-metre telescope at La Silla Observatory. The HARPS data will be complemented by images from an assortment of robotic telescopes located across the world . The telescopes that comprise the Burst Optical Observer and Transient Exploring System (BOOTES) and the Las Cumbres Observatory Global Telescope Network (LCOGT) will support the search by measuring the brightness of Proxima Centauri every night during the two and a half month long project. These observations will help astronomers determine whether any detected wobbles in the star’s motion are caused by features on its turbulent surface or by an orbiting planet. Once the data have been collected by the various telescopes, astronomers can start their analysis. In the following months, their research methods and conclusions will be described in a paper submitted to a peer-reviewed scientific journal. When the scientific community has validated the research, the results will be published, concluding a long and substantial programme of scientific research. Apart from following the scientific observations as they arrive, the Pale Red Dot outreach campaign  gives the public the opportunity to see how science is done in modern observatories, and how teams of astronomers with different specialities work together to collect, analyse and interpret data, which may or may not be able to confirm the presence of an Earth-like planet orbiting our nearest neighbour. “We are taking a risk to involve the public before we even know what the observations will be telling us — we cannot analyse the data and draw conclusions in real time. Once we publish the paper summarising the findings it’s entirely possible that we will have to say that we have not been able to find evidence for the presence of an Earth-like exoplanet around Proxima Centauri. But the fact that we can search for such small objects with such extreme precision is simply mind-boggling,” said Guillem Anglada-Escude, the Project Coordinator. “We want to share the excitement of the search with people and show them how science works behind the scenes, the trial and error process and the continued efforts that are necessary for the discoveries that people normally hear about in the news. By doing so, we hope to encourage more people towards STEM  subjects and science in general,” adds Guillem. The Pale Red Dot outreach campaign will illuminate the often unseen side of planet hunting with background articles and through social media. A bustling array of blog posts on many topics — including planet-hunting techniques, ESO’s European Extremely Large Telescope (E-ELT), and the lives of stars — are planned, written by the astronomers, scientists and engineers from the observatories involved, as well as science writers, observers and other experts in the field. There will be daily social media updates, briefing the public on how the observations are going and any events taking place at the three observatories involved. To receive updates, people are invited to follow the Pale Red Dot Twitter account and the hashtag #PaleRedDot. The name of the campaign was inspired by the famous “pale blue dot” image of the Earth, taken in 1990 by Voyager 1 on its way to interstellar space. The phrase was later used by Carl Sagan for his essay, Pale Blue Dot: A Vision of the Human Future in Space. As Proxima Centauri is a red dwarf star, astronomers expect that an exoplanet orbiting it will appear reddish. At the same time, just as Voyager’s image of Earth was a remarkable achievement for humanity, finding an Earth-like exoplanet around the closest star to us would be a another step towards answering humanity’s biggest question: Are we alone? 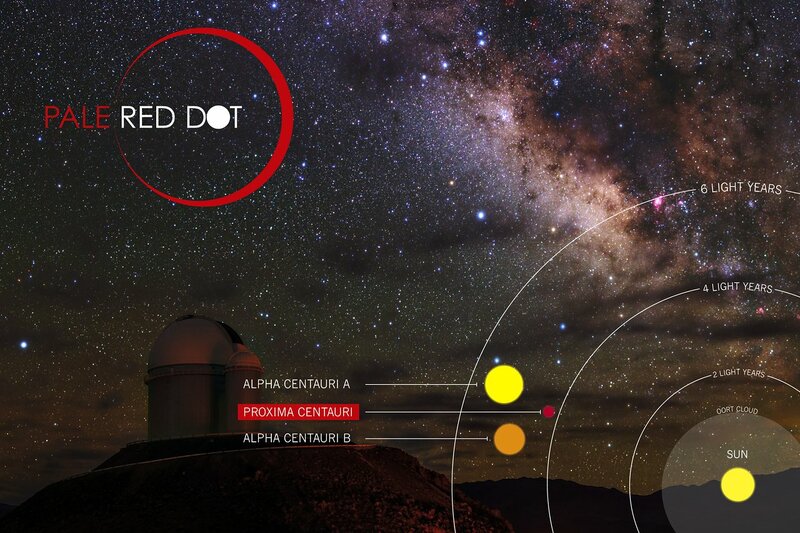 The Pale Red Dot campaign will begin in earnest on 15 January 2016 with observations commencing just three days later from ESO’s La Silla Observatory, situated at the edge of the Chilean Atacama Desert, and continuing until the first week of April. All of the scientific data obtained as part of the project are expected to become publicly available for all to exploit in late 2016. The team of astronomers leading the observations and outreach campaign are: Guillem Anglada-Escude, Gavin Coleman, John Strachan (Queen Mary University of London, UK), James Jenkins (Universidad de Chile, Chile), Cristina Rodriguez-Lopez, Zaira M. Berdinas, Pedro J. Amado (Instituto de Astrofisica de Andalucia/CSIC), Julien Morin (Universite de Montpellier, France), Mikko Tuomi (Centre for Astrophysics Research/University of Hertfordshire, UK), Yiannis Tsapras (Heidelberg/LCOGT, Astronomisches Rechen-Institut – Heidelberg & LCOGT) and Christopher J. Marvin (University of Goettingen). The outreach campaign is coordinated by the project team with support from the outreach departments of ESO, Queen Mary University of London, Instituto de Astrofisica de Andalucia/CSIC, Universite de Montpellier, University of Goettingen, Universidad de Chile and Las Cumbres Observatory Global Telescope Network. STEM, Science, Technology, Engineering and Mathematics. Las Cumbres Observatory Global Telescope Network (LCOGT) is an integrated set of robotic telescopes, distributed around the world. The network currently includes two 2-metre telescopes, sited in Hawaii and eastern Australia, nine 1-metre telescopes, sited in Chile, South Africa, eastern Australia, and Texas, and three 0.4-metre telescopes, sited in Chile and the Canary Islands. Las Cumbres Observatory Global Telescope Network (LCOGT, Inc.) is a 501(c)(3) non-profit organisation, building and operating a network of professional robotic telescopes, deployed worldwide, for science and education. Users include professional astronomers, school children and interested members of the public. LCOGT has the goal to be a world-class scientific organisation, while enabling a new generation of young people to explore the process of science and scientific thinking, through hands-on astronomy. Professional users include the members of the LCOGT Science Collaboration, a group of institutions that have helped us build our network. The Burst Optical Observer and Transient Exploring System (BOOTES) started in 1998 as a Spanish–Czech collaboration devoted to the study of optical emissions from gamma-ray bursts (GRBs) that occur in the Universe. The first two BOOTES stations were located in Spain and included medium-sized robotic telescopes with CCD cameras at the Cassegrain focus as well as all-sky cameras, with both stations separated by 240 kilometres. The first observing station (BOOTES-1) is located at ESAt (INTA-CEDEA) in Mazagón (Huelva) and first light was obtained in July 1998. The second observing station (BOOTES-2) is located at La Mayora (CSIC) in Málaga and has been in full operation since July 2001. In 2009 BOOTES expanded abroad, with the third station (BOOTES-3) being installed in Blenheim (South Island, New Zealand) as result of a collaboration with several institutions from New Zealand. The fourth station (BOOTES-4) was deployed in 2012 at the Lijiang Astronomical Observatory (Kunming, China).